Image caption The RNLI said the river at Ogmore beach has "strong and unpredictable currents"
More than 20 people have been rescued from a Vale of Glamorgan river over the last two weekends, the RNLI has said. 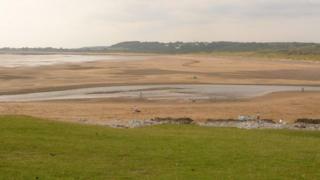 The rescues at Ogmore beach included three children who became stranded near the newly-formed sandbanks. RNLI lifeguards and Penybont Surf Lifesaving Club have now issued a warning to visitors. Supervisor Ross Gribble stressed people visiting the beach need to be "careful", adding: "Always swim between the red and yellow flags."